Just a quick post this morning because I've got to get the kids up and moving and discover how time-bake works on my oven. We're spending the day with friends - lunch at their house and then the rest of it at the little waterpark in the area. So you know that I belong (have hosted) to monthly card groups. I love this kind of swap. It's challenging and I get a whole set of cards that match but are different. This particular challenge was from my sister, she and I are in the same group. She sent paper and images and the challenge was to use both sides of the paper. Well, I couldn't go simple, now could I? I'm such a glutton for punishment. This is the card that I came up with and can't finish because I had to order more paper. Yep, she sent enough to make a NORMAL card, but I couldn't go normal. Gorgeous paper! I love this - it's by Little Yellow Bicycle and I was so excited when I finally found it on A Cherry On Top, I paged through 70+ pages to find it. Then I recognized the name as one being on Christine's (All That Scraps) clearance list. So off to All That Scraps, typed the name in the search box and there it was! Hopefully the paper arrives today or tomorrow. I know you've all seen this fold, it's very popular right now and Beate has a great video tutorial (scroll to the bottom) on SCS, too. I've been wanting to try it. I didn't get to use as much of the orange side as I had hoped, to - but I think it came out really pretty. OK - off to read the owners manual on my oven. I hope you enjoyed my card. Thanks for visiting. Oh I just loved this tutorial, never had the nerve to try it though! How awesome that someone paired purple with orange - what a yummy combo! This came out so pretty,I love the soft elegance of this. Good luck with the time baking! This is so pretty and challenging! Looks complicated! Turned out beautiful! Beautiful card! 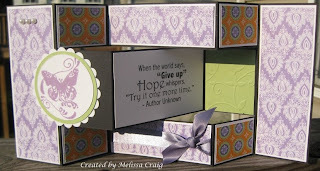 I love the paper and you did a great job with this tutorial. I have a card that was given to me but have yet to try...hmm. 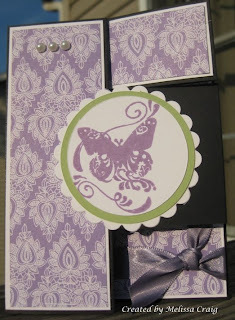 Gorgeous card mel...I have yet to make one of these, but I really must try soon. Wow! I've been meaning to try this technique and you have aced it -- so elegantly, too! !